The cover is bright and beautiful, featuring a sparkler. My thought is that not only is this going to be a perfect summer read – i.e. 4th of July, summer vacation, plenty of time to get in trouble and hang out with friends; but I’m also thinking the sparkler may be indicative of the main characters personality. Or perhaps it is something to do with celebration – the title also has a by-line that says “For better or for worse, in sickness and in health…as long as we both shall (graduate) live.” (So perhaps my summer prediction isn’t quite ON it! 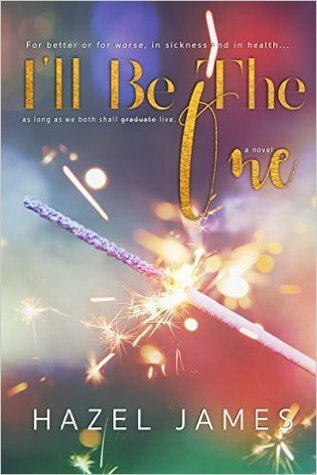 😉 ) The colors, however, scream “America” and “Freedom” and “Celebration.” The title “I’ll Be The One” indicates to me that it is likely that this is a romance (without me having to search out the genre). As far as the age group goes – My first guess was YA, but the bi-line makes me think Upper YA, and maybe pushing NA. I do like the simplicity of this cover. While I do like covers with people on them, I’m also thankful when there are none. That way, instead of giving me a visual on what the author/publisher/cover artist thinks the characters look like, I’m free to decide on my own. For better or for worse, in sickness and in health, as long as we both shall graduate.